In the near future, a Helium3 minor stationed on the Moon is finishing a 3 year contract for Lunar Industries and eagerly anticipates going home to his wife and child. As the days tick by, with only his computer GERTY to keep him company, Sam begins to suffer from halucinations and physical deterioration. With just under two weeks left, while doing a routine Helium3 deposit extraction, Sam comes face to face with a predicament that will question his very exsistence. "Moon" is inherently complex, brilliantly told, beautifully filmed and ultimately an exceptionally thought provoking concept. Director Duncan Jones (David Bowie's son) delivers a mind bending scifi story that is masterfully performed by actor Sam Rockwell. The cinematography throughout the film is breathtaking and truely envoked the utmost desolation of space. "Moon" furthermore, sets an eerie tone from the get go that is perfectly matched with an strangely alluring score. "Moon" moves at a sluggish pace, however the multi-layered plot keeps the viewer deeply entrenched throughout the 97 minute running time leaving you with questions and conversation trying to puzzle together the various avenues of the intricate plot. "Moon" offers a throwback to the days of old with making science fiction movies and the result for me was astonshing. I throughly enjoyed all the work done with the hand made models that were used for the exterior space scenes and lunar vechiles on the moon base named Selene. Despite a few very noticable green screen scenes, all of the exterior shots were remarkably nostalgic towards earlier scifi work like; 2001: A Space Odyssey and Alien. It is really nice to see a director utilize models instead of computers for a majority of the special effects, whether or not his decision was based on funding, the result was stellar. Furthermore, the sets within Selene were fantastic. The design of the various bays also ressurect imagery from classic scifi films that fans are sure to notice and appreciate. Sam Rockwell is an absolute master of his craft and here in "Moon" he takes center stage in the science fiction story created by Duncan Jones. Rockwell plays Sam Bell, and does a brilliant job of playing every avenue of his varying character with flawless precision. Rockwell had stated that he prepared for this role for six months, and the result is staggering. As the character of Sam Bell, Rockwell perfectly portrays a man who has been isolated for some time and longs for the affection of his wife and daughter or connection to his life back on Earth. As the film progresses, so does Rockwell's performance in it's intensity. Particularly, the second and third acts of the film really allow for Rockwell to display his abilities in a variety of ways. The beauty in Rockwell's performances comes from the daring look at how isolation and space can change a person in both positive and negative ways. During the film, he has confronted his temper, dealt with his mistakes or downfalls and is left with nothing but himself to face. Not surprisingly, Rockwell is able to take on the heavy role and does a fabulous job making "Moon" an enjoyable and thought provoking movie going experience. Kevin Spacey voices GERTY, Sam Bell's only shipmate other than himself. The bot's construction is very basic however, quite ideal for the base's design. Spacey's voicework is extremely good and the simplistic smiley face icon's he used for emotion were perfect. GERTY provides key laughs with his face icons, in the otherwise heavy film, making the case for another science fiction A.I. character that film goers will definately embrace like R2D2 or Hal 9000. I cannot say that I got what I expected from "Moon." Quite honestly, I was misled by the trailers and any news I had read surrounding the film since Sundance. However, what I got instead was just as pleasing, if not more so. I expected another scifi thriller and what I got, was a much deeper story that focused on the testament of the human spirit with an underlining question of, what makes us all human? Between both Sam Bell and GERTY the question is left up to the viewer. "Moon" leaves some of the results seen on screen open to debate, which in my humble opinion, usually is the mark of an excellent film for the ages. 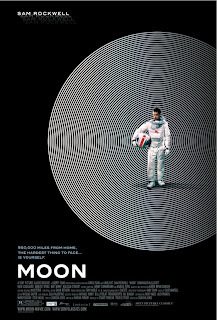 Ultimately "Moon" is a brilliant film that is magnificently acted by Sam Rockwell. The movie unfolds the intricate plot quite delicately delivering steady blows of shock and bewilderment along the way that, truely do make you think. All of the imagery, special effects and score throughout the film are fantastic and help to create an all encompassing science fiction story that, doesn't seem too far off or unbelievable. For any scifi fan, "Moon" is definately worth a watch and if you are a fan of Sam Rockwell, the film is not to be missed this year. "Moon" is currently in an limited 8 theater release through Sony Picture Classics, so finding it may be difficult, but it is well worth the time.